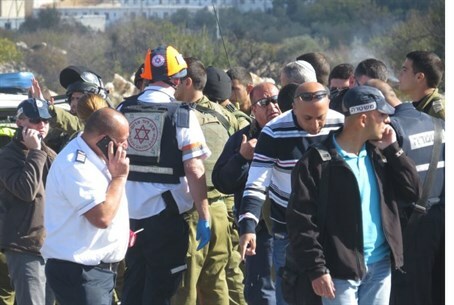 One wounded as soldier attacked by female terrorist, hours after stabbing attempt in Samaria. A female Arab terrorist arrived at Gush Etzion Junction in Judea on Monday morning and tried to stab an IDF soldier, in an attack in which one person was lightly wounded according to Magen David Adom (MDA) reports. The terrorist tried to flee the scene according to reports, evidently after the soldier managed to fight her off, but IDF soldiers on patrol who were active in the area shot her and wounded her critically. An initial investigation identified the terrorist as Amal Fahri Takatka aged in her twenties of Beit Fajjar to the south of Bethlehem, located adjacent to Gush Etzion. She is identified with Palestinian Authority (PA) Chairman Mahmoud Abbas's Fatah faction and had been arrested and spent time in an Israeli jail in the past. According to the Palestinian Arab Al-Quds news source the terrorist was 22-years-old and had spent a year in jail previously for stabbing an IDF soldier in exactly the same location, reports Walla!. Video from the scene of the attack has been circulating the internet. In it the cameraman can be heard describing the scene as police are around the terrorist as she is on the ground and shoot to confirm she posed no threat, out of concern she may have been wearing a bomb belt. However, apparently the terrorist was not killed as she was evacuated to a hospital. MDA paramedic Eyal Zahavi who was at the scene of the attack said "this was a stabbing attack attempt at the Gush Junction, a citizen was wounded in mild condition and received first aid on site and didn't need to be evacuated to the hospital." "The terrorist, a youth in her twenties who was shot by security forces and was critically wounded in her upper body, lay nearby. Together with military medical forces we gave her medical treatment and she was evacuated to Hadassah Ein Kerem Hospital by a military emergency care vehicle," added Zahavi. An IDF statement read "security forces on site overpowered the suspect and transferred her for further medical assistance," reports AFP. Dalia Lemkos hy"d, aged 26, was murdered in a terrorist attack that left two others wounded at the nearby Alon Shvut Junction last month, mere feet from the hitchhiking station where Eyal Yifrah (19), Naftali Frenkel (16) and Gilad Sha'ar (16) hy''d were abducted and murdered by Hamas terrorists in June. Earlier on Monday morning Border Patrol officers arrested an Arab terrorist who arrived at Tapuach Checkpoint in northern Samaria carrying a knife, thereby foiling a stabbing attack. At around 8 a.m. the terrorist arrived at the checkpoint walking from the Arab village of Yatma to the east. The suspicions of a Border Patrol officer of the Alon Battallion who manned the surveillance position at the checkpoint were raised as the terrorist approached wearing a hood. "I immediately shouted to him to stop in place, but when he continued walking and didn't stop I went on to report to the checkpoint commander," the officer said. On receiving the report, the commander and another soldier began running towards where they were told the suspect was. The officer and his comrade ordered the man to stop, and only after they cocked their weapons did he do so, at which they cautiously approached him to conduct a search which he refused. The officers then used reasonable force to subdue the terrorist, and found a knife on his person. He was carrying no identification and refused to give his identity. Additional Border Patrol and IDF forces arrived on the scene, while the Battalion commander began investigating the suspect. In the investigation the terrorist said he was an 18-year-old resident of Shechem (Nablus), after which he was taken for further investigation and identification by the Israel Security Agency (ISA or Shin Bet). Alon Battalion commander Chief Superintendent Atif Sirhan noted that "Tapuach Junction is a serious friction point in the Judea and Samaria sector. This year we foiled at Tapuach Junction attacks and arrested no small number of terrorists." "At this Junction and in general the combat soldiers are required to be at maximal alert and to act quickly, as they did this morning," added Sirhan. "We will continue to carry out operational activities at the Junction and in general so as to ensure the security of citizens of the state of Israel." Tapuach Junction isn't the only point of concern of course; just last Friday an Arab woman carrying a knife outside of the Cave of Machpelah in Hevron was arrested, and admitted to having planned to stab a soldier.